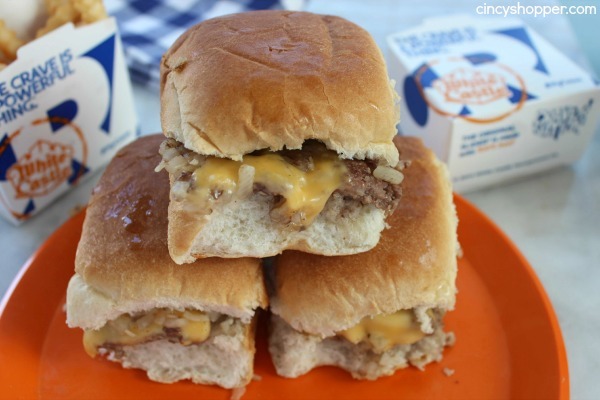 These CopyCat White Castle Sliders are super simple to make right at home. They are perfect for feeding a crowd or even a great dinner idea. Such a fun appetizer or meal. The perfect party burger. My family loves sliders! The answer I receive to “What would you like for dinner?” is quite often “Can we have White Castles?”. I love sliders myself so sliders are dinner quite often. We have a White Castle restaurant right up the street from us, very convenient. I really enjoy making our own Restaurant CopyCat recipes at home when I have a really good recipe. 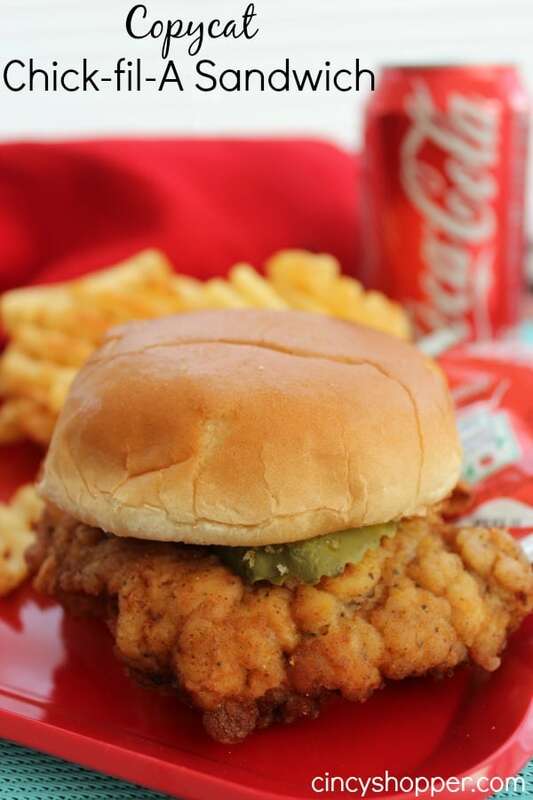 Our favorite CopyCat recipe is our CopyCat Chick-fil-A Chicken Sandwich. They are my families most requested sandwich. 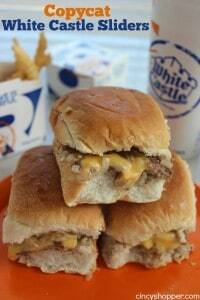 That was until I made these Homemade CopyCat White Castle Sliders. These things have been so popular, especially with my boys. 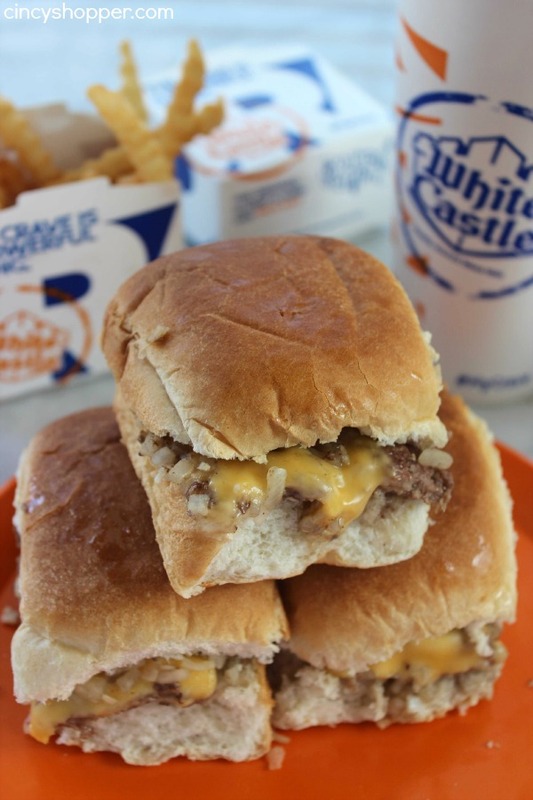 Just a few ingredients are need to make your own homemade White Castle Sliders. You can make them with or without cheese. The directions I have included may seem long but I wanted to be detailed. These sliders are really quite simple to make. 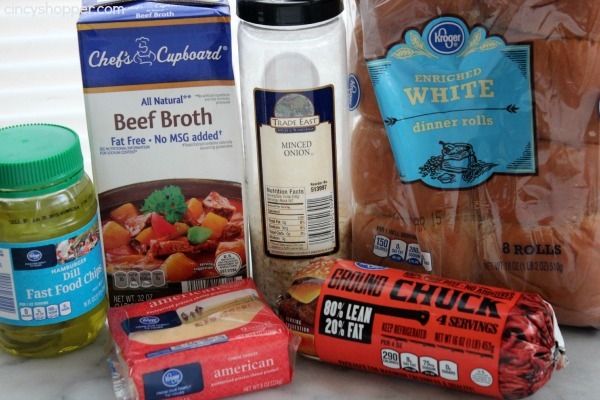 I use white dinner rolls to make our sliders. 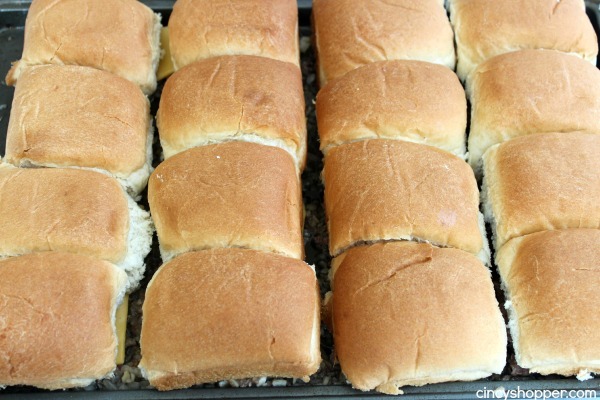 You could also use slider buns that are available at most grocery store. I have found the dinner rolls work best though. 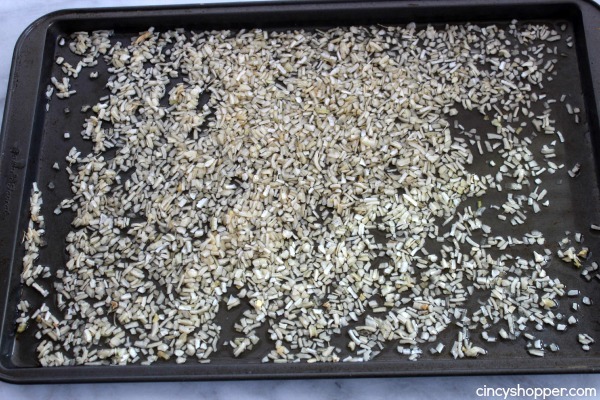 Line a 10×15 pan with parchment paper. Mix ground chuck, 2/3 cup beef broth and salt and pepper together until mixture is easily spreadable. Gently press and spread meat mixture into prepared pan until you form a thin even layer. Using a knife, score each into 16 equal rectangles. 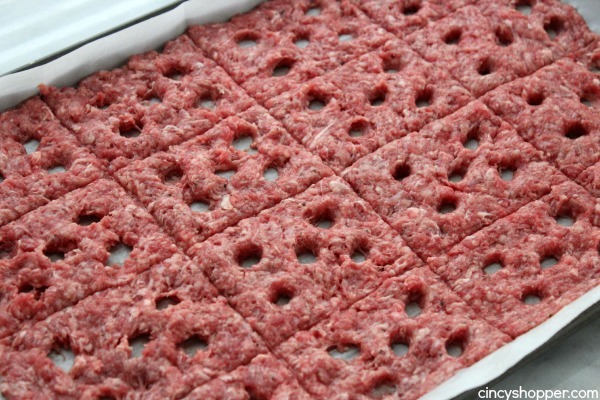 Use your finger to make 5 holes in each patty. Place in freezer for at least 1 hour. 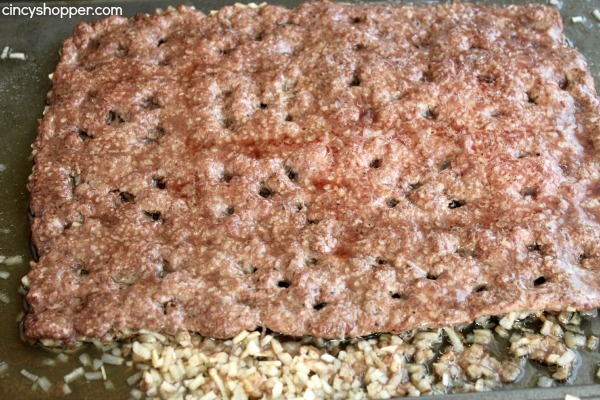 Remove frozen patties on parchment paper. Pour remaining beef broth (1 2/3 cup) into a baking sheet and spread minced onions over entire bottom of pan. Allow to sit for 5 – 10 minutes. Cut all dinner rolls in half to make buns. Place frozen beef on top of onion mixture. 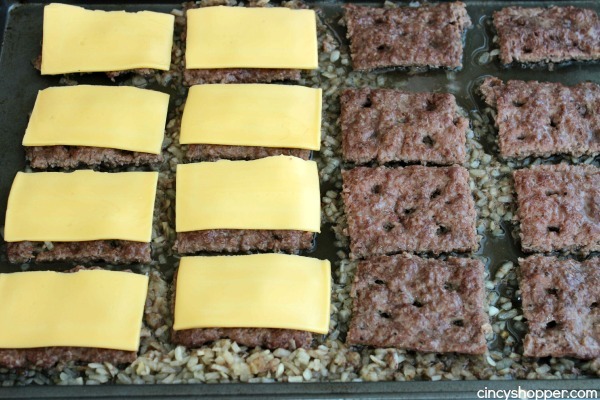 Place in oven for 10 minutes to allow burgers to steam cook (until they turn brown). Remove and place cheese on each patty (if you are making cheese sliders). Top each with a bun top and return to oven for 3 minutes. Use a spatula to pick up each slider half and place on bun bottom. 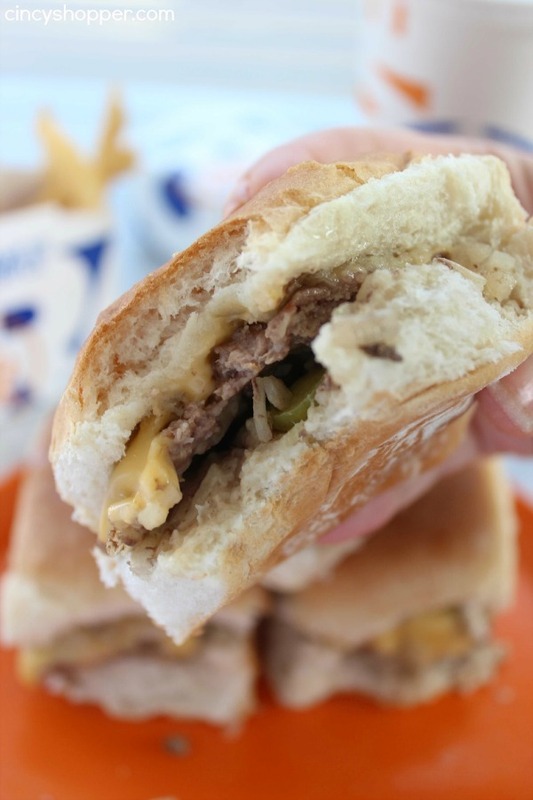 These sliders will make for a great dinner idea for your family. 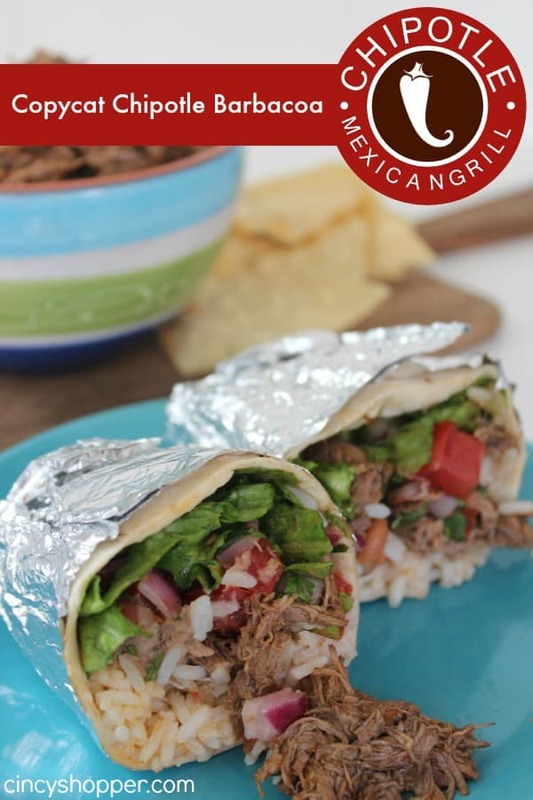 They are perfect for feeding a crowd at your next party or game day. Do you have a favorite restaurant copycat recipe? Line a 10x15 pan with parchment paper. Allow to sit for 5 - 10 minutes. Place froxen beef on top of onion mixture. Made these tonight and they were a *big* hit!!! My only modifications were to use Ground Round that I caught on sale this weekend, and to only use 1-cup Broth in the baking pan (glad I did because my short-rimmed pan was almost too full when it came time to pull to put the cheese on — my ground beef must’ve had alot of moisture in it). Steak Fries, mustard, and dill pickles rounded-out the meal. 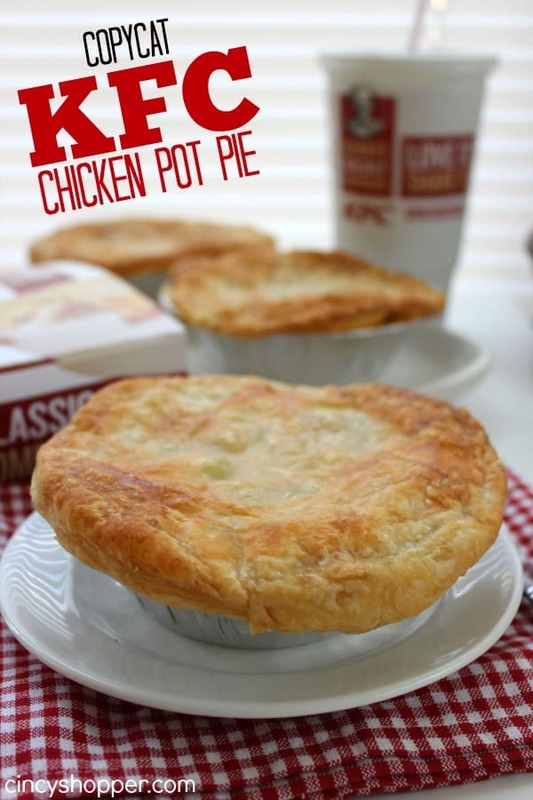 Really good recipe & saved us an hour drive to the nearest White Castle. Thanks! Made these tonight and everyone loved them. Living in Texas, White Castle is a few states away or in the frozen section of the local grocery. Wife said it was like the real thing as she lived up north. Did this verbatim and they came out really wet. Cooked a few more minutes but would not add as much fluid. Maybe my baking sheet was too short. I have made these several times because they are delicious! Just like White Castle but better! I do use less than a cup of dried minced onions bc that’s just way, way too much. I just lightly cover the pan, lighter than shown and lessen the liquid. If you usectgat much liquid you have to pour some out before adding roll tops or it’s a soggy mess. Made this but my hamburger shrunk so much. These are super easy and really good! After reading the comments, I took the advise of others and used only half of the two separate amounts of the beef broth; could’ve done less than 2/3 cup of broth with the onions. Will for sure make again! !